Despite losing our wonderfully niche ‘unbeaten in December since 2014’ record, Derby delivered a healthy 11 points from 18 in a month where performances rarely convinced. The race for promotion remains wide open with our form and fragility summing up the wider picture. Norwich and Leeds had threatened to set the pace and pull clear by the end of 2018, but thanks in part to our own heist at Carrow Road, the top two have been reined in and remain within striking distance for the whole of the top six. The Rams are right in contention. Our Dec 1 victory over Swansea set the tone for the month with an over reliance on Harry Wilson, a failure to cut out crosses and misplaced passes among the back five. The three points were followed by four more away at Wigan and at home to Forest, courtesy of back-to-back clean sheets, for the first time since the three consecutive wins over Ipswich, Preston and Hull in August. Marriott, Wilson, Bogle and Mount celebrate Derby’s gritty 1-0 win over Wigan. For much of December we lost our attacking verve. The tension and heightened importance of the East Midlands Derby certainly stifled the ambitions of both sides’ flair players and we didn’t see the slick passing and interchange that our front five have delivered for much of the season. An early Jayden Bogle cross for Jack Marriott to expertly nod home provided the breakthrough against 10-man Wigan. Bogle, while still struggling in defence in the wide areas, is starting to get more dangerous crosses into the box and realising he doesn’t always have to beat his man to deliver them. Long may that continue. Martyn Waghorn showed why so many Derby fans had been calling for his return with a neat finish inside the box against Bristol City, but found himself left out again as the Rams rolled over in a tumultuous second half at Bramall Lane. Ultimately, Derby were blown away by clever, committed opponents and were unable to push on after another Wilson wonder-strike – a near-carbon copy of his free-kick against Stoke. While no-one saw a Tomori strike in off the bar being Derby’s lifeline, it neatly summed up the craziness of the next 90 minutes (floodlight break included). 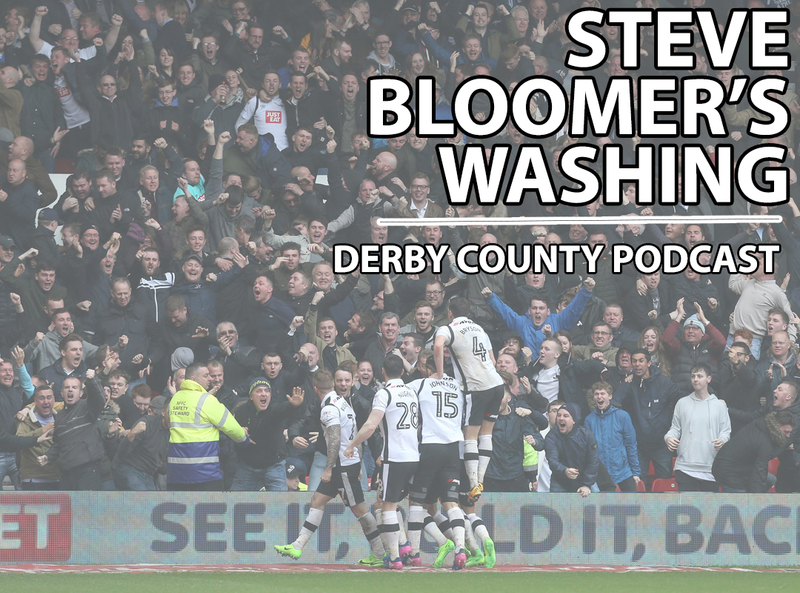 The momentum swung Derby’s way and by the time Mount netted his first goal since September to equalise it was a deserved riposte following a spell of intense pressure where we finally looked threatening from corners. Mason Mount had a much-needed return to the scoresheet in the Norwich thriller. Derby were unfortunate to go behind midway through the second half, but until we get organised at the back we will always be susceptible to conceding at crucial moments. Defensive fragility is not unlucky. It is an achilles heel that needs to be fixed. Thankfully, the staff at Carrow Road were able to fix their floodlights and Super Frank made more of the break than his widely celebrated opposite number, Daniel Farke. Duane Holmes and David Nugent made telling contributions as Florian Jozefzoon and Jack Marriott completed Derby’s most thrilling comeback since that FA Cup replay at the City Ground in 2009. If Derby can use the Carrow Road victory as impetus, Tomori’s intervention may prove to be the most important goal of our season. With George Evans completing 90 minutes on an impressive return at Norwich (followed by another 77 against Boro), Lampard now has his full array of midfielders available and it will be interesting to see the pecking order emerge through January. From the little evidence available, Evans brings much-needed attributes – mobility and anticipation in midfield, strong in the tackle and calm on the ball. Evans was a central part of Jaap Stam’s Reading side that were a penalty shoot-out away from promotion two seasons ago. Their success was built on an obsessive (often intensely frustrating, but extremely effective) possession game, which demonstrated Evans is comfortable retaining and offloading the ball in uncomfortable areas. Another month, another scream from Harry Wilson – this time against Swansea. Bradley Johnson’s four-match ban and Craig Bryson’s underwhelming December are poorly timed in the context of Evans’ return and he has immediately jumped ahead of them. It appears Frank is keen to explore Wilson with Mount in the middle again, which suggests there is room for only one of Evans or Huddlestone at the base of midfield. The option remains of pairing the two together in a 4-2-3-1 with Mount, Wilson and one other playing ahead of them, behind Marriott. It would sacrifice an attacker, but free up Huddlestone to concentrate more on his passing game and add a degree of much needed solidity and control. The Rams now have healthy options to discover the magic formula in the second half of the season, not to mention Max Bird and Joe Ledley (remember him? ), among others. Scott Carson’s place should never have been under threat and any calls for a new goalkeeper were hugely premature, but his form has not been as consistent as last season. Combine that with an obvious desire to have a ‘keeper comfortable with the ball at his feet and you could imagine a world where if Carson fails to deliver the kind of match-winning saves we became accustomed to last season, more questions would begin to be asked. Pep Guardiola was originally criticised for prioritising a ball-playing goalkeeper over a proven shot-stopper, but his decision has paid off and other clubs have followed a similar approach. Keogh and Tomori are often reluctant to ‘go home’ and our play at the back has often got us into trouble. Carson’s distribution has improved generally in December, and he delivered a string of important late saves against Nottingham Forest, Bristol City and Norwich City. Lampard leading from the front in the “desire and commitment” stakes. He calls for it from his players and shows it on the touchline too. It (rightly) got him into trouble away at Rotherham, but he looks to have the found the line now and seems to enjoy winding up opposition fans and benches in equal measure. He’s quick to stick up for his players and Norwich demonstrated the strong team spirit he’s developed at Moor Farm. The final whistle celebrations at Carrow Road. They were always going to be epic after that match and finish (how many times have you watched it now? ), but I’ve never seen the players run instinctively straight to the fans like that before. Whether on loan or here permanently, the whole our squad are really bought into this season and want to take the fans with them on the journey. From a technical standpoint, Harry Wilson ran his own Goal of the Month contest once again. His first against Swansea City and his free-kick at Sheffield United are the main contenders, while Jack Marriott’s winners against Wigan Athletic and Norwich City were vital – the latter standing out due to the composure needed so late in an emotional, rollercoaster top of the table clash. But Wilson’s 25-yard swerving strike at Pride Park gets it. All too often Wilson gets overlooked because it’s too obvious or there are so many, but you’ll struggle to find a better goal than that across the whole division, let alone just from those in a Derby shirt.